So it's kind of crazy that Christmas is creeping around the corner, and I'm still trying to get through a blog backlog that stretches out to July. Yikes. Fortunately my family and friends aren't completely crazy about gifts and going overboard with that whole 'ho-ho-ho' thing, so my Christmas shopping expeditions are usually pretty laid back and for me, it's more a time to catch up with friends and spend some time with them, reflecting on the year, usually over some good food. What are you guys like during the silly season? Do you guys find you eat out more during this time of year? 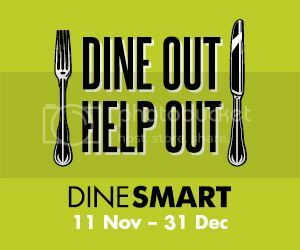 From now until the end of the year is also when StreetSmart's DineSmart program kicks into gear, meaning you can enjoy a great meal out (like many of us will), but also give back to the community and help out those who may be doing it tougher through Christmas. It's super simple, as part of the DineSmart program, partnering restaurants ask guests to simply add a small donation to their bill at the end of their meal, which can be as small as $2. Not even the price of a coffee. What does your money go towards? A whole range of projects to support homeless refugees and charities, from helping to provide food and shelter, to critical services and emergency aid, to projects that promote social inclusion and sustainable change for people who are homeless. After all, we all ought to have someone warm to sleep, food to eat and some genuine social interaction don't we? 100% of the funds raised go towards homeless organisations. Last years efforts helped to fund 99 grassroots projects, and maybe this year, with everyone's help, we can enable StreetSmart to help so much more. It's really so simple to be a part of, and it does make a difference. I know I'll definitely have my eye on the DineSmart website over the next month and booking dinner dates with friends at the partnering restaurants. With a variety of partners such as Longrain, Crabapple Kitchen, Bay City Burrito, Chin Chin and many more, you're bound to find a restaurant on the list that everyone you're heading out with will be happy to visit. And it's not just in Melbourne, but also in New South Wales, South Australia and Queensland, so don't forget to share this great initiative with your inter-state friends as well! I've always loved the idea of DineSmart (and the other initiatives that StreetSmart run through the year), but just been a bit disorganised and forget to pop it up on my blog! So now that I've done it (and I know you're reading it if you've gotten here), be sure to visit the DineSmart website to check out the restaurant partners, or see how else you can help out. What a fantastic idea! I've bookmarked the website and plan to check it out soon. Thanks for sharing, it's always nice to know that there are different ways to help out others who need a helping hand. Sounds great! Thanks for posting about it!